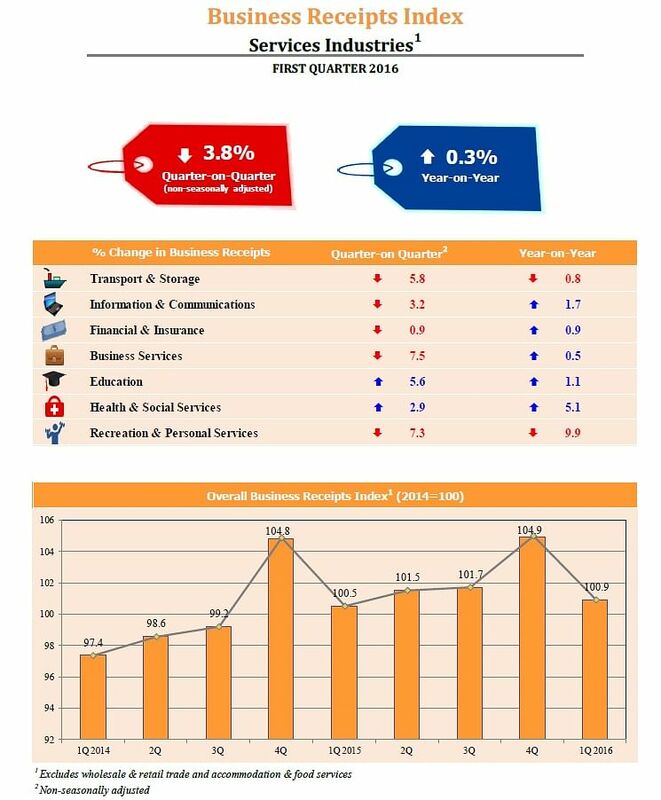 SINGAPORE - Business receipts for Singapore's services industry in the first three months of this year edged up 0.3 per cent from a year ago after being flat in the previous quarter. On a quarter on quarter basis, though, turnover fell 3.8 per cent. In year on year terms, most industries saw growth. Industries that performed well included health & social services (+5.1 per cent), information & communications (+1.7 per cent) and education services (+1.1 per cent). The financial & insurance and business services industries grew 0.9 per cent and 0.5 per cent respectively. But sales fell 9.9 per cent for recreation & personal services and 0.8 per cent for transport & storage services industries. The data released on Friday (May 27) by the Department of Statistics excluded wholesale & retail trade, and accommodation & food services.